The leader of IPOB, Nnamdi Kanu on the 26th of September, 2016, although may have been forcefully granted his wish when John Tsoho shamefully recused himself from the case between him and the dictatorial government of Nigeria led by Buhari, although Tsoho yielded to the will of his legal team having failed to win the argument on why he must withdraw from the case, it still does not make his continued practice as a career judge in Nigeria palatable. Appointing a new judge to preside over Kanu's case may become a case of "pouring a new wine into an old wineskin", if he (Tsoho) is not forced to resign or sacked, so as to serve as a deterrent to anybody that would want to make mockery of the Nigerian judiciary. As a judge, Tsoho was expected to be responsible for making sure that dispute between individuals like Kanu and the government is resolved according to established laws, he was also expected to protect individuals right from government excesses; But No!...John Tsoho was so eager to do Buhari's bidding by sitting upon a previous court order issued by his fellow justice Ademola, that Nnamdi Kanu should be released unconditionally; thereby prolonging his unjust incarceration. Judges are basically required to preside over court hearings and trials, supervise legal proceedings and uphold the right of individuals involved in a legal process; But in John Tsoho's case, he always ended up transforming into a chief prosecutor in every case he was appointed to preside over. Example is the case between Babalakin and the EFCC, where like Kanu's lawyers, he was forced to withdraw himself from the case, having been found to be under duress to unjustly convict him. Judges we are made to understand, are to ensure that trials are conducted according to established rules and procedure, which include ensuring that testimonies and evidences submitted are effectively perused, transparent before the audience present and found to be admissible in court. But in the case of John Tsoho, he impudently reversed his decision to not only allow masked witnesses testify against Nnamdi Kanu, but also ominously nodded in concurrence by allowing DSS to obstruct people from entering the court premises, thereby advertently initiating secret trial. Read also:BIAFRA: NIGERIAN JUDICIARY DRAGGED TO THE MUD AS NNAMDI KANU'S DEFENCE TEAM MUSCLES JUSTICE TSOHO OUT OF CASE. Another quality of a noble judge which is conspicuously lacking in John Tsoho, is that judges must have moral courage. It is a very important judicial attribute. They should be ready to make decisions that will be unpopular to corrupt politicians like Buhari, the media and the public, especially in cases that involves an individual and the government. But in the case of the very corruptible John Tsoho, his decisions right from the moment he verbally condemned Kanu, as posing "flight risk" due to his dual citizenship, right after his pay-master Buhari vomitted same thing during his media chat is a pointer to the fact that he was being biased and sentimental. John Tsoho lacked the moral courage to oppose the views of a tyrant in Aso Rock, he was eager to fulfill the wishes of his puppet master. This became more evident when he stubbornly refused to recuse himself from Kanu’s case on several occasions, until his name appeared before the office of the Chief Justice of the federation (CJN). Read also:BIAFRA: NATIONAL JUDICIAL COUNCIL BLASTS JUSTICE TSOHO: ‘’YOU ARE RECKLESS AND MUST BE PUNISHED FOR ABUSING JUDICIAL PROCESS." In civilized countries, judges are held accountable for their actions/inactions, and going by the gross misconduct and incompetency displayed by Tsoho in Kanu’s case, it would be right to say that he should be punished. Until punitive measures instituted for the likes of Tsoho is enacted, the so called effort to rid the Nigerian judiciary of filth is said to be fruitless and incomplete. If injustices like the one meted out on Kanu through Tsoho is allowed to continue to permeate without outright sanction, it becomes a tradition; why?.... because, the originators of the crime committed were failed to be punished immediately. Judge Tsoho is not only a bad egg within the judiciary, but also the "oily finger" that has soiled the image of the entire judiciary and must be sacked for others to live up to desired expectation. The implication of allowing him to go unpunished, would be the loss of faith and trust in the legal system of Nigeria, as it will be assumed that all of the wig bearers on the bench are corrupt. 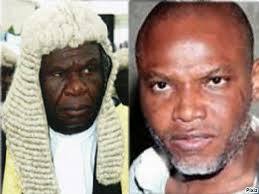 Read also:BIAFRA: FORCEFUL WITHDRAWAL OF CORRUPT JOHN TSOHO FROM KANU'S CASE, A CUE FOR NEW JUDGE TO TREAD THE PATH OF JUSTICE. The Judiciary will continue fooling themselves and repeating the same mistakes if proper measure to distinguish the goat (like John Tsoho) from the sheep is not adequately put in place. The corrupt judge is there, and you still want to bring in another judge to continue to preside over same case without doing away with the cause of the problem?..No it makes no sense. Appointing a new judge is not the problem in Kanu's case, but getting the incorruptible judge is. The only solution to getting the new judge not to dance to the rhythm of Buhari is by ensuring that John Tsoho is sacked outrightly. This trend cannot continue, we cannot be dancing the same music all the time, we cannot be pushed into changing judges countless time when we know the root cause of the problem. Judge Tsoho was the major problem in Kanu's case and Buhari was and still remains the manipulative figure behind the jury. The only solution is to sack Tsoho and appoint a judge that will be ready to allow the chip fall where they should, irrespective of the one whose Ox is gored. As we await the appointment of the new judge, we live in anticipation that the Chief Justice of Nigeria and the National judicial council will allow the hammer fall on John Tsoho who appears to be a clog in the wheel of justice.